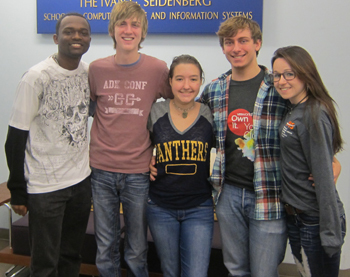 Brooke, Michael and Julie all became familiar with the Seidenberg School’s programs and its supportive community as well as life in the “Big Apple” while participating in the 2010 Seidenberg Scholar Summer Experience prior to entering their senior year of high school. Judging from their comments, they see more than satisfied with their choice of college. In order to determine how well the new Scholars were faring, we sent them a brief questionnaire. Judging from their responses, they appear to be faring quite well. Q: What made you come to Pace to study computing? Q: Now that you are here, what are your initial impressions? Q: Do you have a good idea of what you might want to do when you graduate? Q: Is there anything else you would like to say about yourself or your college experience so far?